I, along with a great number of people (they get over 500 emails a week according to Lyndsay Fenner who ended series 6 as its producer) have been contributing comic material to one of the few open door radio shows for writers; BBC Radio 4 extra’s Newsjack which includes in its remit a role to find and develop emerging writing talent. During series 6, there were 102 writing credits of which 86 were for non-commissioned writers and many of those regularly hang out and post on the British Comedy Guide Forum. When each series is live, the Forum becomes a hotbed of sharing of news of success, failure and critiquing each others material that was surplus to requirements. I have learned over a short period of time that comedy writing requires a precision unparalleled in other genres. That every word must punch above its weight. “Get in – make your point – and get out” has been some great advice. As a development tool, we can all apply these rules of thumb at work to great effect. It was a comment on BCG and a recognition that there was a wealth of material being discarded each week – some of it really good quality provided by writers with many existing BBC credits to their name, which made me realise we were missing the opportunity to harness that experience, wit and enthusiasm. In effect take forward the work of BBC Newsjack and develop our own talent ourselves So at the end of Series 6 in March, I suggested a social gathering at my unusual home on an island in the River Thames. But I also suggested we throw some writing ideas around. And from there the concept of putting a show together, recording and podcasting it was born. 14:00 -15:00: Writing, redrafting of sketches. 15:30 -16:30: Script Eds rewrite/give ideas for rewrites of sketches and others work on short stuff. 16:30 – 18:00: Further script rewrites and filling any gaps for one-liners. 19:45 – 20:00: Reprinting any scripts. Run time approx 45 mins (including 30 mins of sketch) or whatever decent material we have. A NJ-esque feel but with creative cheeky twists on the format. Aim for 20 sketches to make sure we’ve sufficient material. Kirrin Island specific elements. One possibility is Points Of View / What The Papers Say. Three or four segments throughout the show, with Ann Robinson introducing and linking the opinions, which are performed in a series of amusing voices. Could be done as Kirrin Island’s Points Of View, seen from the perspective of the islanders? Maybe some stuff about how outside events affect the islanders and their lives. Topical news events – but since this is not a broadcast as such, focus should be on a good show. Podcast to be relevant into the future – so include ongoing zeitgeist stuff and possibly review of the year so far. One or two things per month before arriving at (and concentrating on) June. Well folks, it’s T-2 and that distant idea of a few drinks in the sunshine by the river for BCG newsjack writers has now materialised as our own topical comedy show to be broadcast by Brooklands Radio in two weeks time. How did we get here? Amazingly things still seem to be under control. So, now is the time to up the ante on the topical sketch writing – and I can see some of you have made a start – we shared some great ideas at the pub on Wednesday eve. Dan and Stu have been really hard at work thinking through the structure of the show and how the F5 characters are going to work within it without jarring. We’ve come to the conclusion that they will have an adventure (still to be determined) but this won’t be the mainstay of the show which remains the topical sketches. We’ve also thought through the KI angle and believe that we need to consistently use KI as a mirror of reality – only leaving the island in exceptional circumstances possibly via a KI radio news report or some other device. This means characters in your sketches will often be mirrors of those we are satirising and thus named accordingly. So there are no constraints on the stories we can cover. This gives the show a strong USP. Guys it’s T-3 and a bit (23 days to go) and I’m sending this a little early because I’ve got exciting news to report that last night (with Dan’s help) I visited Brooklands Radio’s studios BrooklandsRadio.co.uk and talked them into a scheduled broadcast of our show on Monday 18th at 7pm followed by a repeat at the peak slot of 9pm on the Friday 22nd after the sports programme. Now I’m not trying to kid anyone that this is BBC Radio 4; this is an internet based radio serving much of Surrey but it is a very credible station and it means our show will be broadcast to a guaranteed listening audience on the Monday – and not just launched by podcast into a black hole. I shall probably hold the podcast back to Wednesday and drive interest (with all your help, tweeting, retweeting, blogs etc) to the 7pm broadcast on Monday. It also means we’ve got a real purpose to fulfil as Brooklands Radio will be running a teaser for the show over the next couple of weeks and Dan is giving some thought to a 30 secs sketch for that teaser. They also have a listen again service and an iTunes feed. So everyone, with 23 days to go, let’s get writing – including the additional material that Dan requested. The issue over ultra-topicality remains. The sketches up on critique are good examples of stories that can run for a while if people listen to the show a month or two downstream so do consider that. It’s T-5. The commissioning note for contributions through BCG has now gone up here. It’s generating interest with material arriving off-line. Hoping to see sketches appearing on the critique forum within the next couple of weeks. Q1. So any strong feelings one way or another on the name? I want to go firm within a fortnight. …No strong feelings re name. Live from Kirrin Island has the advantage of being flexible for future reuse. …I think I’ve come round to the Kirrin Island idea now that I know what it is (Sorry wasn’t a Famous Five fan as a kid!). Happy to go with that and gives us lots of ideas for sketches that we’re not sure to cover. Throw in 4 pesky kids and a dog and we’re half-way there. Q2. Should we be open through BCG or do it more privately? I invited many people – but only those who were regulars on the NJ threads. Does the timing of the commissioning feel right. Earlier/later? …The worry with contributions through BCG is that we offend people by not using it. The worry without is that we don’t have enough material! Either way is fine I think, providing there’s a T-3(?) deadline that gives us enough time to rewrite. Regardless of whether we use BCG or not, we can’t be as current as Newsjack (due to full-time day jobs!) but I think if (as per NJ) the producers and script editors/lead writers have a couple of weeks to read through everything, put it in yes/no/potential ‘piles’. Anything that is agreed upon is worth working on/asking for rewrites and will at least narrow it down. Reading/evaluating scripts will take a lot of time, so this will be a fair bit of evening/weekend work pre-the get-together. Then, a couple of days before I suggest that same core team decide on what else ‘current’ needs to be covered, then the smaller teams get to work on these to build some sketches on the day. …The only problem I can see with opening it up is the very real danger of getting swamped by submissions. I’m sure we won’t get 675 subs like the peak of NJ. This is reason so few of the BBC shows are open access. On the other hand who are we to exclude anyone else? I would suggest at least restricting the number of entries from each person (maybe a higher limit from your “commissioned writers” 🙂 but that’s up for discussion). …Timing is fine to me. I guess a lot will be driven by how topical we want to make it. More topical tighter the deadlines will be so perhaps best to keep it last two weeks or so. I agree about opening it up as we’re in great danger of getting in hundreds of sketches that I don’t think we have the manpower to read! If we did want to open it up we could do something like Treason does and ask for a couple of sketches as an ‘audition’ and then invite people to come on the day? Perhaps in the future could open it up more but to avoid us all spending two solid days reading sketches perhaps we need to limit it somehow. …if we want the absolute best quality then opening it out will raise the bar, as long as enough people are willing to sift scripts. But if it’s about having the chance to contribute a lot to a whole series of shows as part of a writing team, keeping it tighter is better. I’d prefer the latter, but without keeping it a complete closed shop. Two weeks sounds about right in terms of events to cover. And if we’re short on good news, we could also cover things that are ongoing but started before that (where Newsjack would say “no”). Q3. Do we want to limit the cast to four. Or – if they are there on the night anyway – do we use more voices for variety in the sketches? …I think we need to use the actors to do the acting really. Four (or five) should be enough for the casting, but the writers need to know what breakdown is before the call goes out for sketches as they’ll have to write with those in mind. A writer’s brief ideally will need to go out. …I think more than four – but not a huge cast (less than 40!). As we probably won’t have a lot of pros performing it might make sense to have a bit of rotation to let people get their heads straight between sketches and give anyone that wants to a go. Also makes it easier to rehearse split into groups. I think someone (probably you, as you are driving this) should have a final say on things like casting and performance – just to avoid arguments. …I guess we don’t need to restrict it to four, particularly if we need impressions and we may not be able to cover everyone required with just 4 people. But again as David says a cast of thousands might be more difficult to organise and be a less enjoyable viewing experience. The joy of a NJ recording is watching Justin run the show and Lewis mess around. One thought – if impressions are a problem and we go with Kirrin Island we could just have characters on Kirrin Island like posh PM Candid Cameron and the mayor of the city Boris Droneson etc. etc. Might make it easier rather than having to nail down specific voices? …If you have enough good people, I’d have a few more. Gives more variety of voices as you say, plus it means more time for each actor to rehearse each bit, i.e. they have less sketches each. Getting your neighbours to read out our equivalent of JackApps is a nice idea – doesn’t matter if it needs retakes/goes a bit wrong as all part of the fun for the crowd. We’ll want to find the right balance between giving ourselves enough time to come up with a polished script we’re proud of, but not too much effort on the day – which I want to remain ostensibly social. So I’m thinking of a 1pm-ish gathering and lunch And then we concentrate on editing material including sketches etc we’ve got to hand. Several additional BCG members have offered to send material too, so I think plenty of upfront preparation including inviting members to put stuff in ‘critique’ for consideration will pay dividends. 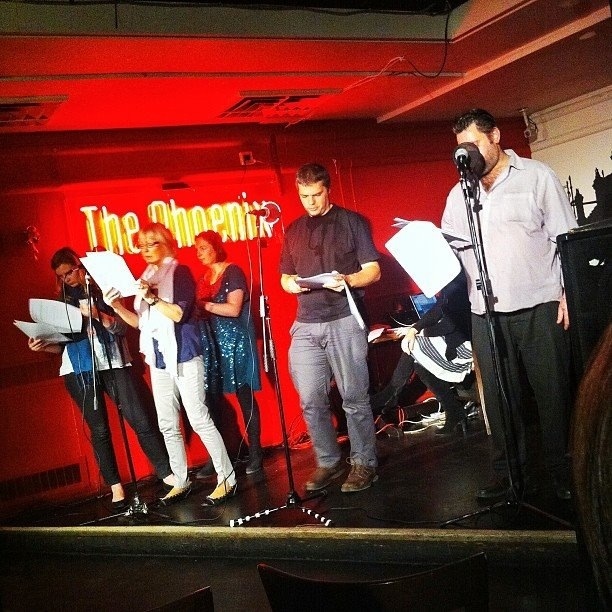 If I ask the ‘audience’ to arrive for a recording of the script at 7:30pm, does that allow ourselves enough time? – presumably we can split up our effort into concentrating on the host’s material and linking it together whist others are polishing/improving the sketches? I suggest we aim for about 45mins of running? That seems neither too long nor too short. Do you agree with the timings. Does that allow us enough time to polish a script? Roughly how many sketches do you think we need (10-15)? Do we use the same premise of topical news events over the preceding week – but perhaps extend to a fortnight? Or as suggested below, a review of the year so far. How do we tailor for originality of the setting eg Kirrin Island Residents Association, KI lifeboat station or preferably some completely new ideas? …From experience, that is very tight timescales you’ve got there, so we’d have to have a lot of sketches ready before the day. For NJ, on Tuesdays, there is a two-hour(ish) meeting at 10:30 that the script editor leads covering what has happened and what needs to be covered. The writers write the scripts, the script editor reads and asks for rewrites. Everything is wrapped up at 5:30/6ish, but the script editor then gets on with rewriting the sketches and writing the links until 9:30-10pm(ish). I guess this continues into Wednesday morning and then the cast readthrough is at 1pm(ish). So, as long as the sketches don’t need much rewriting and are mostly all there or one of the script editors/writers is willing to work on just that, and someone else works on the links, we might be able to squeeze it in. I think an 8pm start time might be better, with a 6:30-6:45 readthrough. …Can anyone do (or is willing to do) impressions, as that is going to be a major point in writing the sketches! In terms of run-time, I guess we record what we have. If we only have 20 minutes of ‘decent’ material, then that is how long it is! (1) I think they’re tight, so it may be rough’n’ready unless we have most of the sketches written before we turn up. (3) Fortnight would be better. The emphasis needs to be on a good show, not on getting a topical show broadcast (as we’re not really ‘broadcasting’). …I did go to a couple of BBC workshops back in the day that were similar things though. Based on that, 1pm might be a bit late to meet given there will be lots of people who’ve never met before, general writing chat etc, plus I remember that time seemed to go very quickly when trying to write/polish a script to an imminent deadline! Maybe along lines of 11.30-12 arrive, lunch at 12-1, 1-2 “team writing” (everyone look at scripts and rough ideas together, chuck in lines/ideas for improving) 2-3.30 writing, redrafting of sketches. 3.30-4.30 script eds rewrite/give ideas for rewrites of sketches and others work on short stuff. 4.30-5.30 any final script rewrites and filling any gaps for one-liners. 5.30-6 break and printing scripts! 6-6.45 readthrough. 6.45-7: any final tweaks, 7-7.15 reprinting any scripts. …You could adopt a Points Of View / What The Papers Say kind of format maybe. There could be three or four segments throughout the show, with Ann Robinson (how is your Ann Robinson impersonation?) introducing and linking the opinions, which are performed in a series of amusing voices by the rest of us, just like the real Points Of View. Perhaps it could be done as Kirrin Island’s Points Of View, seen from the perspective of the islanders? I know nothing about Kirrin Island or it’s inhabitants (I’ve only ever met one), but I suspect if you said the words “The residents of Kirrin Island”, then most people would form their own opinions based on a lazy stereotype of who they were, so that might be something worth going with? So, maybe some stuff about how outside events affect the islanders and their lives? …I think you’re right that 10-15 sketches is about right, and keep them under 3 mins and ideally under 2 mins for most, with some shorter so a mix of styles. I think you’re definitely right to also add some new stuff with an island theme – not least to get the audience on board! Would ideally be short, e.g. could have one-liners but with idea that it is people on the island who are giving their views. Aim for 30 mins of sketches max, then break them up with some short stuff and different length sketches would help the audience, plus host stuff if you go down that direction. …I wonder if (partly to salvage some of the better unused sketches folk submitted last series) we could do it as a ‘this is the year so far’ kind of thing? Possibly one or two things per month (although this would mean needing people to write stuff about April and May events too I guess…) before arriving at (and concentrating on) June? …In terms of content I’d use similar ‘shorts / one-liners’ like NJ to have a different pace to the show and to give a chance to squeeze in some last minute lines. Not so sure about some Kerrin local stuff as I’d have no idea about it and if the podcast is the main aim perhaps best to keep general? Perhaps we could cover big stories from the last month and then more of the more recent stories. For example at the minute might still be worth putting a few fuel strike / budget jokes in if we were recording it at the mo. …I’d love to have some sport in it! Too many of these topical shows ignore all but the biggest sport stories and yet it seems rather popular. I reckon we should squeeze in a sports section in the same way probably good to have a celeb section and a tv section as well. …Who gets the final say? Both what goes in the programme and editing. Probably worth thinking about this as someone will need to make the hard call one way or another (or at least devise a system for it). Should there be some briefing beforehand so we don’t all write 3 sketches on the pasty tax? Will we allow more than one sketch on a subject?. How will we choose what goes into the final 20 sketches? If we’re short on a big story do we need to write one on the day? …Also worth thinking about how to edit other people’s sketches. Something worked well for our group before is split into smaller groups, discuss ideas / changes but original writer gets the final say. That way at least it remains very much their sketch.